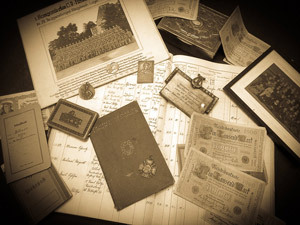 The results of family research have always been portrayed on representative family trees or genealogical tables as a way to give them full appreciation. A family tree is a great eye-catcher in your home, can spark a lot of conversations, encourage the discussion amongst members of your family, and may even motivate some family members to also do research on their ancestors. 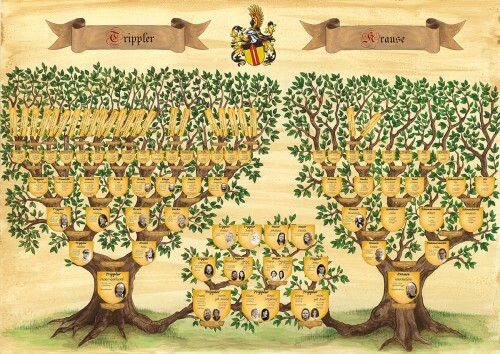 Not only in your home but in your offices, as well – a family tree is a great way to highlight your family`s tradition or to emphasize (for example) that your ancestors may have been working in the same field for centuries. 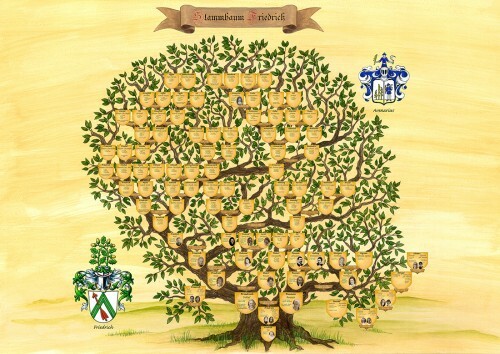 In cooperation with an artist we are able to create these family trees to your liking (as well as genealogical tables, which are also referred to as family trees in the following). 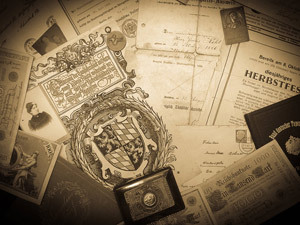 Speaking from our experience there are two main reasons to have a family tree created: 1) After some years of your own research you may be looking for a way to top it off with a work of art, 2) There may be a birthday, an anniversary, or another important event ahead and you are looking to gift a family tree to your loved one. If you are already in possession of all information required to create a family tree we will simply have a discussion about the artwork you would like to see (please note the information found below). 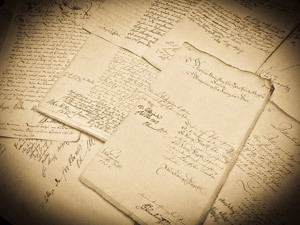 If you are looking to present the family tree as a present and have not yet had any research done on your family we are more than happy to assist you with the research as well as the creation of a family tree. We will gather information about your ancestors and collect all data necessary. This task may take a few months as we are dependent on appointments given to us by ministries, archives, and civil registry offices. Please feel free to read more about this field of our work filed under „genealogical-research/family research“. The information available will be compared with you to ensure there are no mistakes. 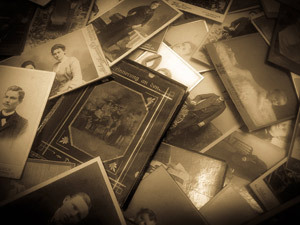 We ask for you to send us photographs of your family members and ancestors to be encorporated into the artwork. You can decide on the size of the family tree. We do not recommend to use a size smaller than DIN-A2. We will have a discussion with you concerning all the ways the artwork can be done. You are free to choose between different styles of plates into which the names and dates of your ancestors will be written. You will receive a sketch to show the shape of the tree, the branching, and all other portrayals. You can decide whether or not you are satisfied with the results. Our paintress will draw your family tree in acrylics after which it will be scanned professionally and we will start the final process of digital processing. We will then begin to add the plates, family crests, etc. 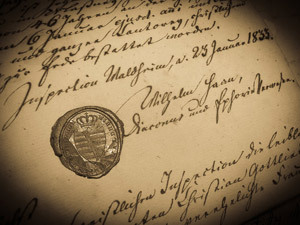 (depending on what we have agreed on beforehand) as well as all the names and dates of every person on your family tree. You will receive the finished product (we will even have it framed for you if you so choose). We have spend a lot of time thinking about what we feel is the best procedure for our costumers. Creating family trees completely by hand has a lot of drawbacks: They are more expensive, changes are very difficult to make and it is not possible to replicate the family tree as easily as it is with a digital version. The difference will not be notable in the finished product. We are always happily available for any further questions you may have.